The Mediterranean diet is based on the traditional foods eaten by people living in the Mediterranean region, especially Greece. It's loaded with healthy foods and research findings suggest following this diet may help reduce some of the risk factors for heart disease. The Mediterranean diet is high in fiber and antioxidants from vegetables, legumes and nuts, far greater than the typical Western diet, and low in saturated fat. Very little red meat is eaten in this region, and milk consumption is limited as well, except for some cheese and yogurt. Oldways designed a Mediterranean Diet Food Pyramid to help you see which foods are best. The base of the pyramid is made up of foods like whole grain bread, cereals, pasta, potatoes, and rice. Fruits, legumes, nuts, and vegetables make up another large share of your daily diet, along with smaller amounts of cheese, yogurt, and olive oil. Poultry, fish, and eggs are eaten weekly, and red meats are eaten about once per month. Oldways also suggests you drink six glasses of water every day, along with moderate consumption of red wine for some people. The Mediterranean Pyramid even allows for one sweet treat every week. Replace the fat you use now with olive oil. You probably don't want to add more calories to your diet so use olive oil in place of butter, margarine and other salad dressing oils. Olive oil is good for cooking too. Eat lots of vegetables. This idea just can't be stressed enough. Every healthy diet includes lots of vegetables. Many people in the Mediterranean eat a pound of vegetables every day. Green and colorful vegetables are low in calories and high in antioxidants. 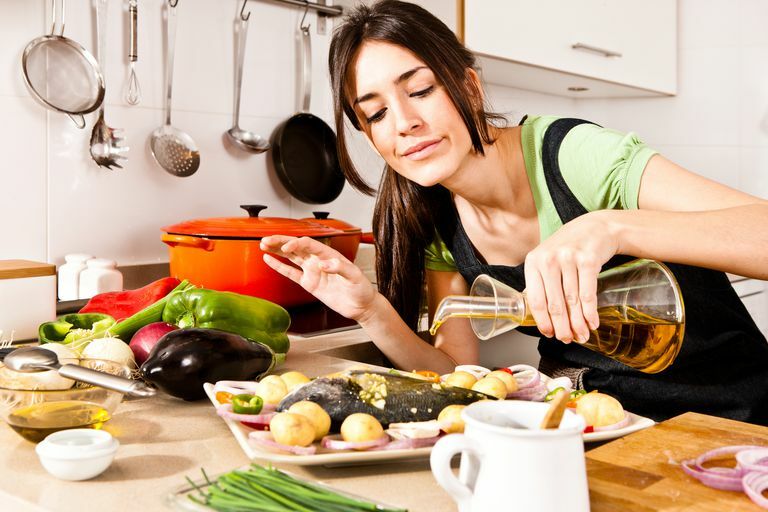 Prepare Greek vegetarian dishes several times each week. Enjoy a little starch. Choose whole grains more often because they're higher in fiber. Potatoes and polenta, which is made from cornmeal, are also commonly used as starches in the Mediterranean. Eat poultry and fish. Fish contains omega-3 fatty acids that are good for your heart and your brain. Plus, fish is low in total fat and calories. Poultry and eggs are also acceptable protein sources. Bake or broil your fish or chicken, don't deep fry it. Breaded and deep fried foods don't fit this diet at all. Limit red meat consumption. Red meat has a lot of saturated fat that's not good for your heart, so there isn't much room for steaks and hamburgers in this diet (only about one meal per month). Instead of a greasy burger from a burger joint, make a ground turkey burger on a whole grain bun instead. Add lettuce, a slice of avocado and tomato, and you won't miss the red meat. Discover legumes and nuts. Legumes have lots of fiber, protein, and nutrients and can be used in the main dish. Choose fava beans and other dry beans. Nuts such as almonds, walnuts, and cashews make a delicious and healthy snack. Enjoy fresh fruits as dessert. Avoid sugary pastries, cakes, and cookies. Fruit is lower in calories and high in fiber and nutrients. Yogurt and cheese are sources of calcium. Choose some low-fat yogurt and cheese every day. You could make a yogurt dressing or try a healthy salad with tomatoes and feta cheese. Keep it light. Drink water and wine. The Mediterranean Pyramid includes six glasses of water every day and a glass or two of red wine. Water is good for everybody, but don't drink red wine if you're pregnant, underage or if drinking alcohol puts you or others at risk. Switching from a typical western diet to a Mediterranean diet seems difficult if you're not used to olive oil, fish and some of the vegetables and seasonings often associated with this region. But it's quite delicious. Rees K, Hartley L, Flowers N, Clarke A, Hooper L, Thorogood M, Stranges S. 'Mediterranean' dietary pattern for the primary prevention of cardiovascular disease. Cochrane Database of Systematic Reviews 2013, Issue 8. Art. No. : CD009825. DOI: 10.1002/14651858.CD009825.pub2. What Is a Whole-Food, Plant-Based Diet? Should You Try the Metabolic Typing Diet?